Dexter Jackson's place among the greats was already clear, but he further cemented his legend with a historic win at the return of the Masters Olympia! The Master's Olympia is back! The event that captivated crowds in Miami's famous Fillmore Theater this weekend was the first since 2003 to go by that mythological name—or more specifically, the Master's Olympia and IFBB Pro World Championship. Whatever you call it, the show was a great success that offered a great lesson: Paying attention to training and diet in your 20s and 30s will pay dividends from your 40s and beyond. The packed audience was treated to an incredible lineup of contemporary stars and established legends. While the night belonged to the competitors, the guest posing routines by Phil Heath, Ronnie Coleman (who stripped down to smiley-face posing trunks), and Samir Bannout made sure the theater kept shaking around the award presentations. Each of the 34 competitors was over 40, but guys like Dexter "The Blade" Jackson and Toney "X-Man" Freeman looked like they've been tapping the Fountain of Youth for their protein shakes. These stars showed the brightest, but evening offered plenty of surprises and new faces. Andrew Jemmott, in his pro debut, surprised everyone with his stunning symmetry, and 1980 Mr. International Andreas Cahling rocked the stage in a blaze of bearded glory. Friday's prejudging placed Freeman, Jackson, Dennis James, Ed Nunn, and Ronny Rockel in the top five. "The Blade" may have been sharper than the rest, but none of the bodies in this group lacked sharp cuts. The winner was largely a foregone conclusion at the prejudging, but the stage was set for a heated battle for the next placings. The finale didn't disappoint. After the introduction of all 34 athletes, the top 15 performed individual posing routines. As expected, Jerome Ferguson, "Tricky" Jackson, and the always-entertaining Darrem Charles brought down the house. His performance was one of the night's highlights, and "Hollywood" Ferguson spent more time dancing than he did posing. Who knew guys so big could get so low? 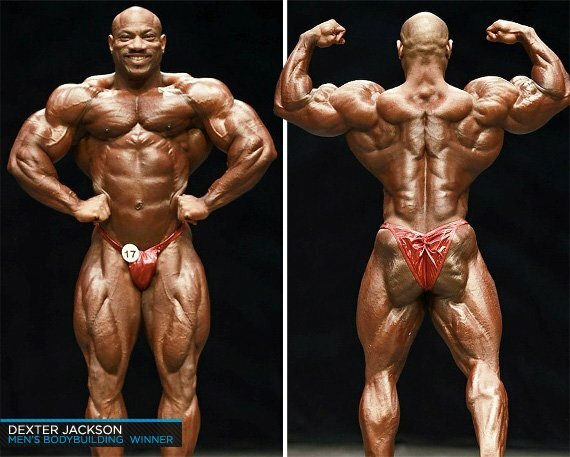 After the individual routines, the judges called Freeman, Dexter Jackson, James, Nunn, Rockel, and Michael Kefalianos. 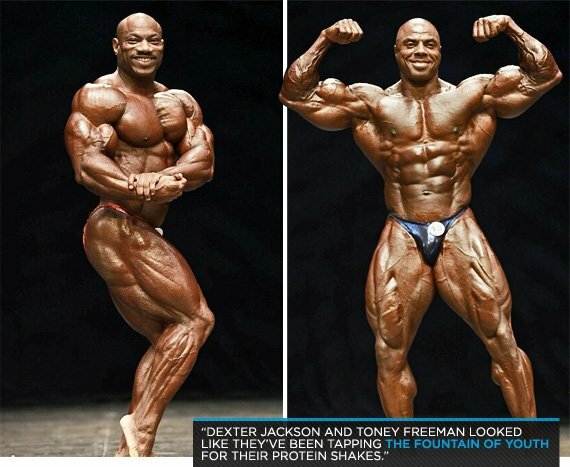 Dexter had the crowd and had a superior physique, and Freeman looked better than he did during prejudging. His second-place finish seemed to be a lock. James, who came out of retirement to compete, was also in stunning shape. After the top five guys walked back into line, judges called in the next bunch. Troy Alves, Charles, Bill Wilmore, and Jemmott came out in that order and stayed there through their poses. Spots 7 through 10 looked like they were sewn up. Even though they didn't make the top 10, the last five competitors on stage were still impressive. The judges shuffled Big Sean Allen, Lee Banks, Ferguson, Tricky Jackson, and Nate Wonsley around like playing cards, but Tricky Jackson looked to be the best of the rest. While the legendary men danced, posed, and flexed across the stage, women's Fitness, Figure, and Bikini athletes were not to be overlooked. Unlike the Master's Olympia, these events were open events packed with competitors in their 20s and 30s. Wins were no small matter, since they included invitations to the 2013 Olympia. The Figure competition was particularly competitive, especially between first and second places. But in the end, Candice Lewis got the win over Kamla Macko. India Paulino won the bikini contest, and Natalie Planes won the fitness. The finals arrived and the judges called Rockel to fifth place, Nunn to fourth, and James to third before calling Freeman and Jackson to the middle of the stage. The two men clasped hands, bowed their heads, and awaited the decision. Although the crowd thought they already knew the winner, tension still hung in the air. Jackson's win not only marks a new goal for other competitors to aim for, it also demonstrated that age doesn't matter—especially considering that Jackson placed fourth at the Olympia earlier this year. At 43, his great genetics, full muscle bellies, and conditioned physique were just as dominating in this lineup as they were when he was named Mr. Olympia back in 2008. He's set a new standard—and a high one.